Use labor productivity measures to determine foodservice operation staffing. Controlling food costs is an important component of ensuring the profitability of your food service operation. However, food costs are only part of the picture. It is also necessary to control labor costs and forecast labor demands accurately if your business is to succeed. If you have more staff than is required, your labor costs will be too high and the company will lose money. If you have insufficient staff for a particular time period, customer service will suffer. Your goal in planning staffing and scheduling needs is to match labor supply with customer volume so that you can provide quality service without excessive cost. The food service industry is labor intensive. Technology has not replaced people with equipment (though some foodservice operations are experimenting with robots which cook and assist in service.) Unlike an automobile manufacturing plant, a restaurant cannot store its product until tomorrow or the next day if customers are not buying today. The same seat in the restaurant can only be sold a fixed number of times, based on the operating hours and number of turns (rate of turnover of customers). Therefore, it is critical to be able to forecast the number of customers you will have, the peak customer periods, and the staffing needed to provide service to those customers. Sound human resource management policies can increase the productivity of staff. You must first choose qualified, interested, and trainable employees. Once these employees have been recruited, they must go through an orientation period in which they learn about the job and their responsibilities, the company’s way of doing things, and the required level of product quality. During this initial period, the employee’s productivity might be low. Labor costs in the foodservice industry continue to increase from year to year. This can be due to an increasing minimum wage and pressure to pay all employees a “living wage” rather than relying on tipping to make up the difference. In addition, costs have increased because of the stiff competition for skilled service employees, which has not only increased wages but also fringe benefits covered by the employer. Most students understand that wages and salaries are labor costs, but there are many other labor-related costs in addition to the wages/salaries paid. Employee benefits or “fringe benefits” include various types of non-wage compensation provided to employees in addition to their normal wages or salaries. Group Insurance, such as health, dental, vision, life, etc. Some operations may even have other labor-related costs not included in the above list. The real cost of an hour of work is not simple to compute because of the fringe benefits and hidden costs. The first step to identifying labor costs is to categorize costs so they can be picked up as labor costs. For example, employee meals and laundering of employee uniforms are fringe benefits that may be hidden in other cost categories. Overtime should be nonexistent or nearly nonexistent. Management needs to keep an eye on those employees whose time is nearing 40 hours. Money spent on overtime usually indicates poor management and inefficiency. There is much to learn from calculating the real cost of a labor hour. For instance, it is shocking when you consider that in some cases only about 50% of the labor hour is spent productively. It helps when evaluating labor costs to break down the costs by 15-minute intervals and relate the cost to the amount of work that can be produced. When management looks at the cost of a break, idle time, and “leaning” time, it is easy to see the value of training in efficiency, good scheduling of employees, and planning work carefully. The real cost of a labor hour is not the hourly wage, but the real cost may be 20-60% greater when the costs of fringe benefits are added. Figure 13.1 illustrates the cost of one full-time employee when all the fringe benefits are included. A salary based on $8.50 per hour really costs $14.19 per hour. Foodservice operations try to avoid full-time employment and thereby reduce the fringe benefit costs substantially. Figure 13.2 compares the real cost of a full-time cook with that of a part-time cook. The value of the two employees’ work must be considered. For example, the value/quantity/quality of the full-time employee’s work may be twice that of the part-time employee’s work. For one thing, the supervision required by the part-time employee may be much greater. All of these factors are not shown when one compares the hourly wages. Note: Something crucial that this exercise does not compare is the quality of the products produced and of the work. The full-time, trained employee will produce more than the untrained employee. Output can be expressed in number of meals, transactions, or customers, labor dollars spent, or in amount of sales. Restaurants frequently use number of covers or dollars in sales, whereas a hospital or school/college operation would typically express it in number of meals. Input is the number of labor hours worked or scheduled during the period of time or the number of labor dollars spent. The number and complexity of menu items affects the production hours needed. If you have a menu with many items requiring difficult production techniques, you will require more preparation time per item. If your menu consists of a limited number of items requiring minimal preparation, you will require less time. Foods prepared on site require more preparation than similar menu items made with convenience foods, such as pre-portioned meats or desserts. You can reduce your labor costs by using convenience foods. However, you must consider two other factors: convenience foods can increase your food costs and may affect the quality of your product. The second factor – affecting the quality of the product – is not always evident. Convenience foods made with high-quality ingredients and prepared exactly as recommended by the manufacturer can provide uniform portions of very good quality. A restaurant featuring complex dishes with multiple components will require more labor than a cafeteria-style operation or a fast-food restaurant. Also, a restaurant that requires a higher level of skill to prepare complex dishes will require more experienced staff, which in turn means higher wages. The level of service provided to guests will also affect productivity. For example, a fine dining restaurant that provides a high level of attention to guests, will have lower server productivity than a quick casual restaurant that doesn’t provide table service, guests pick up their food at a counter and bus their own tables. The hours open for service are yet another productivity factor. If the foodservice operation closes during slow periods between meals or is only open for breakfast and lunch the labor productivity should be higher than an operation which is open all day or even 24 hours a day. The volume of business will affect the amount of labor required. Each restaurant will have a minimum staffing level without which it cannot operate. If it serves fewer people than this minimum staffing level can handle, the labor costs will be very high. The number of meal periods can affect the productivity of the foodservice operation if different menus for each period require set-up and tear-down time. As well, different menus will usually mean a larger number of menu items, also affecting labor. Restaurant and other foodservice operation kitchens are often designed last, after all of the seating area has been designed (or the rest of the school or dining hall, etc.) As a result, the space may be awkward and inefficiently laid out. 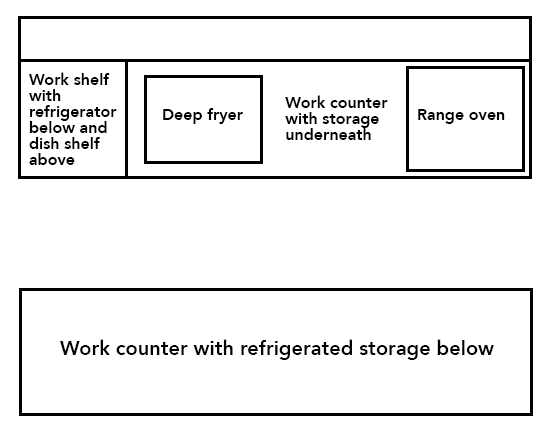 To work efficiently, all work surfaces and storage areas required to produce an item should be located close together, as shown in Figure 13.3. This includes dry storage, refrigerated storage, freezers, storage for plates and glassware, work counters, grills, fryers, and ovens. A work counter is at the bottom. Opposite that is another work area which has a counter area on the left, a deep fryer on its right, another work counter and a range oven on the right. Refrigerated storage is below the counters. Poor kitchen layout can limit the number of individuals who can work efficiently. It may require time-consuming trips to distant storage areas to obtain food items or dishes. If the layout of the kitchen is too spread out, the minimum staff needed to operate each station may increase. For example, if a salad preparation station is located away from the main kitchen, you may require a salad preparation person even when the restaurant is not busy. Production equipment such as mechanical peelers, choppers, and mixers can reduce the amount of time spent doing these tasks. The key in selecting the appropriate facility design and equipment is to match these parameters to expected volume of business. For example, if you purchase too large a mixer for the volume of business, the work involved in cleaning the machine after use will not warrant the extra expense of purchasing the equipment. On the other hand, too small a mixer will reduce efficiency as you will be unable to mix the quantities needed in a single batch. The type of dishwashing system (or higher use of disposables) will also affect employee productivity. Similarly, if your kitchen layout is very compact, you may be able to run efficiently with only one cook. However, you may be unable to meet the demands of a high volume of sales because the kitchen is too small to accommodate more than a couple of staff. A hot, humid, noisy environment reduces comfort and increases stress and may negatively affect performance. Long hours and hard work without reasonable breaks can lead to reduced productivity. The same is true if you are understaffed. Not having enough staff means that everyone else has to work harder or for longer hours, resulting in tired staff and reduced productivity. Managers and supervisors also need to understand how to motivate employees and improve morale to get the highest level of productivity from their staff. Schedule your best employees first to open the restaurant or foodservice each day. Schedule other employees as they are needed. Schedule employees according to work to be done. Avoid the need for using overtime. Train full-time employees to do more than one job. When tasks are done the same way every time, employees are more productive. Station set-ups should be designed for maximum efficiency and then written into standard procedures. A standard recipe format, clear and concise mise en place, and work simplification strategies incorporated into recipes and production schedules helps employees be more efficient. For instance, if six different recipes for one day need diced onions, then it’s more efficient for one person to prepare all the onions at once, than several different cooks all dicing onions. In this case, a food chopper may also be used, which makes the task even more efficient. Production schedules provide the organization (mise en place) and standardized recipes provide all the details needed to increase efficiency. How well employees are trained to do their jobs, including knowing how to do multiple jobs in the foodservice operation (called cross-training) affects how productive they are and the efficiency of the operation as a whole. This is one of the reasons employee turnover is so costly. It takes time, effort and money to get an employee “up to speed” on any foodservice job, not to mention the specifics of each operation, including the menu, recipes, standard operating procedures, etc. When employees leave, new ones need to be trained, adding to decreased productivity and increased costs. Effective supervision keeps employees on task, motivated to do their jobs, and provides intrinsic rewards for a job well done. In many situations there has been a lack of emphasis and training devoted to increasing productivity by foodservice managers. Labor costs are an issue today and foodservice operators who are placing emphasis on increasing productivity will be better able to remain competitive. Management, being aware of productivity, can easily spot ways to improve. For example, it is not uncommon to see employees talking to each other because business is slow—this is poor use of paid time, and it is due to overstaffing or poor scheduling. “Standing time” should never be idle time. Tasks should be set up that will “store up labor.” “Store up labor” means tasks that can be done when business is slow for use at peak times. For example, a cook can prepare nonperishable food items such as croutons, or grate cheese for later use; the waitstaff can wrap silver. Today less and less “from scratch” cooking, particularly baking, is being done in the individual foodservices. Fine restaurants are even going outside to purchase dinner rolls, croissants, and gourmet desserts (also “signature” items—those items the foodservice operation is known for). It is wise for management to compare the costs of convenience foods with preparing “from scratch.” A substantial number of preparation and cooking hours can be eliminated through the use of convenience foods. Convenience foods available can be sampled, and then the same items made from raw ingredients can be precosted and postcosted to determine how much time they take. Could one produce the items for less and will they be better than purchased? Is the frozen, prepared product more expensive? Can labor costs be reduced? To improve the productivity of employees, management must know what the existing productivity rate is, and what it should be, what affects productivity, and must set realistic goals for increasing productivity. Cutting the number of labor hours would seemingly increase productivity; however, that could mean that the job doesn’t get done. Increases in productivity don’t just happen and don’t come overnight. Setting standards, monitoring and adjusting any or all of the above workplace performance factors can all be ways of increasing productivity. A first step in determining staffing needs is to establish productivity standards. These standards must take into account the amount of time necessary to produce food of the required quality. The standards are based on procedures dictated by standard recipes. Productivity standards are measured in labor dollars or labor hours. Labor dollars measure productivity in terms of the number of dollars that must be paid out in labor to generate a certain revenue. The advantage of this approach is that budgets and financial statements are also expressed in dollars so comparisons can be easily made. However, it can be very time-consuming to calculate the labor dollars given different wage and salary scales. Labor hours must still be calculated because the number of hours determines wages. Labor hours indicate the number of hours of labor needed to produce a given number of meals or generate a certain amount of sales income. When you use labor hours as a standard, it is less time-consuming to calculate. As well, some simple tasks may take the same amount of time to complete, whether they are performed by a chef or a dishwasher. Using labor hours as the input for a productivity measure is a “true measure” of productivity because it is not affected by sales dollars or wage rates. The productivity standard is determined by comparing number of labor hours scheduled to meals served or to sales income generated. It can be produced by department, by shift, by position, or by position and shift. More detailed standards make it easier to pinpoint problem areas and take corrective action. The most detailed is to prepare productivity standards by position and shift. This allows you to examine the efficiency of each staff member. It makes sense to look at each position and shift. For example, a breakfast cook working with a limited breakfast menu and items that are easy to prepare can produce many more meals in a hour than the cook on your evening shift who has a large number of menu items with more elaborate preparation needed. Generally, more servers are needed than cooks for a given number of meals. Fewer dishwashers may be required. If only a single labor standard is developed for the restaurant, it will be harder to pinpoint problems with labor costs. Staffing guidelines are helpful for the task of staffing with just enough labor. However, the most exact method of staffing involves direct labor time analysis. Management generally is careful to hire only a basic core full-time crew and add flexible-hour employees as needed. A staffing guide tells the manager how many labor hours are needed for each position and shift to produce and serve a given number of meals in the given restaurant. It incorporates the productivity standards. It tells managers what number of labor hours are needed for the volume of business forecast for a given meal period. The labor hours can be converted into labor dollars to establish standard labor costs. The staffing guide serves as a tool for planning work schedules and controlling labor costs. The labor hours in the guide can be converted into labor dollar and standard labor costs by multiplying the labor hours for each position by the wage scale for that position. The staffing guide should be based on the performance of good employees. When scheduling new employees who have not completed an orientation training period, allowances will have to be made for their lower productivity. This form of staffing guide is much more useful than industry guidelines that do not take into account the specific factors which affect the productivity in your workplace. It may still be useful to compare your staffing guide to other properties in order to assess how competitive you are. An example of a staffing guide is shown Table 1. Note that the staffing guide shows the minimum number of staff per peak service period. Guide shows minimum number of staff per peak service period. One factor that must be considered before developing a staffing guide is fixed costs. Fixed costs refer to the costs of running the operation that do not vary depending on the volume of business. For many businesses, the cost of the building, heating, lighting, insurance, and other similar costs are fixed. They do not change if the restaurant is busy or half empty. In fact, they continue even when the restaurant is closed. Some labor costs are also fixed. If a restaurant has salaried employees, these costs are fixed and do not change depending on the volume of business. The business must pay the salary of these employees, even if the restaurant is not busy. In most restaurants, management positions, including the chef and sous-chefs, are salaried employees. Variable costs must also be accounted for. Variable costs are costs that change based on the volume of the business. Food costs are the most obvious example of variable costs. Provided that the restaurant has not overstocked food, food costs will increase in a direct correlation with the volume of business. Labor hours above the salaried staffing levels are also variable costs. As the volume of business increases, hourly labor costs will increase proportionately. When the staffing guide is used to develop a staff schedule, the supervisor needs to consider the peak periods. For example, if the volume reaches 150 meals, 10.5 labor hours may be needed in the kitchen. An analysis of sales shows that the busiest period is between 6 p.m. and 9 p.m. The supervisor might schedule the cooks so that the first cook comes in from 4:00 p.m. to 9:30 p.m. and the second cook comes in from 6:00 p.m. to 11:00 p.m. This would ensure that there are two cooks available to prepare meals throughout the busiest period. Staggered work schedules can be used to meet the demand over peak periods without incurring additional labor costs throughout the full shift. Part-time staff can be used to work short shifts of four or five hours to reduce overall labor costs. Full-time staff are usually used to cover all key administrative positions; sometimes full-time positions can consist of a mix of supervisory and front-line tasks in order to make up a full-time job. Temporary employees can be used to meet labor needs that are temporary in nature such as banquets, employee illness, or vacation relief. Legal considerations such as the requirements of the Fair Labor Standards Act and provisions of any collective agreement must be kept in mind. Staff capabilities should be taken into consideration; some employees may thrive in a stressful dinner rush while others perform well under less stressful situations. Some employees may have additional skills (e.g., hosting, bartending), which can be used effectively when sales volume is low if collective agreements or staff policies permit. Employee’s preferences should also be accounted for in the schedule. Policies should be in place for requesting shift preferences or exchanging shifts between staff members. No matter how well you have planned the schedule, problems can arise. A staff member may call in sick or fail to show up without warning. The volume of sales may be lower or higher than anticipated. You must have contingency plans to deal with these problems. You could have a staff member (or a casual employee) on call in case he or she is needed. You also have to know the capabilities of your staff. On a night when you have mostly experienced, capable servers and cooks who can handle stressful situations, you may be able to get by with one fewer staff than your staffing guide calls for. When demand is lower than expected, you must know what limitations there are on sending staff home early, while still maintaining the minimum staffing needed to remain open. Of course, you must comply with collective agreements and all legislation that affects your workplace. If you understand the agreements and the Fair Labor Standards Act (2) well, you will know what flexibility you have to adjust to the situations that arise in the workplace. A comparison of actual to budgeted labor costs can be used to plan future expenses. If your labor costs are higher than desired, you need to find ways to reduce them. One method of analyzing the labor costs is to look at the actual and budgeted labor cost percentage. The projected labor cost percentage is calculated by dividing labor dollars by the projected volume of sales. The actual labor cost percentage is the actual labor dollars spent for a given time period divided by the actual volume of sales. Can a particular task be eliminated? Is training or cross training needed to improve the skills of staff? Can a task be reassigned to a person who is not as busy (e.g., could the dishwasher assist with some pre-preparation of items early in the shift)? Can slow periods be utilized more effectively to prepare for high-volume times? Does the menu need to be simplified? Is there standardization or simplification that can be done for systems of the operation? Do menu or volume changes require changes in facility layout? Would convenience items reduce costs without reducing the required quality? Should more part-time workers or temporary workers be used? Or is there a need for more flexible schedules or split shifts? Is overtime being used carefully or not at all? Is there an opportunity to introduce self-service or vending somewhere in the operation? Are the activities of another part of the operation affecting the performance of this department (e.g., the catering department has opened a new conference room some distance from the kitchen which requires food service)? Have there been changes in volume and peak times that need to be considered? Is the time open for service being maximized or does it need to be adjusted? Has paperwork been reduced as much as possible through computerization? After considering all of these factors, you may still not be able to reduce your labor costs. You may have to raise your menu prices to improve the profitability of your operation. Of course, you need to consider the price the market will bear and the prices charged by your competitors before taking such an action. It is often useful to look at both your food costs and labor costs when deciding whether a price increase is needed. If your labor costs are a little higher than anticipated and your food costs are lower, there may not be a problem. Some companies use a figure of 70% to 80% as a target for the sum of labor and food costs. Another strategy is to have lower contribution margins, but increase your volume. This makes sense because the more volume you have, the more money is contributed toward meeting your fixed costs of doing business. Productivity standards are developed by considering the labor hours needed to perform assigned tasks. During a designated observation period, employees are asked to perform their jobs, adhering carefully to all established policies and procedures. They are carefully observed to ensure compliance. For example, cooks would be expected to follow all standard recipes, take scheduled rest breaks, and meet the required quality standards. This process of analyzing productivity is called a position performance analysis. The employee is observed over several shifts. At the end of each shift, the supervisor completes a report, as shown in Figure 13.4, which indicates the name of the employee observed, the meal period considered, the number of meals prepared, number of hours worked, and number of guests per labor hour. The supervisor also records comments on workflow, adequacy of service, problems that arose, etc. Tools like this can help you identify the productivity of each staff member. Perhaps one cook is capable of producing 40 meals to the same standard in the time it takes another cook to produce 30. The first cook is more productive, and therefore a better choice to schedule on the busier evenings. You may also use this analysis to set goals and identify development options. All in all, food costs and labor costs make up the bulk of the costs in running a successful kitchen. Having a solid understanding of both and how to manage them will be key in running a successful food service operation, whether it be a food truck or a major hotel. (1) “BLS Information”. Glossary. U.S. Bureau of Labor Statistics Division of Information Services. February 28, 2008. Retrieved 2009-05-05.